This is based on a great deal of research by Public Lab contributors and was initially pioneered in our community by @nedhorning and @cfastie. See especially these two research notes. Also see this page for how to do this with a Raspberry Pi camera. Vineyards, large farms, and NASA all use near-infrared photography for assessing plant health, usually by mounting expensive sensors on airplanes and satellites. At Public Lab, we've developed a Do-It-Yourself way to take these kinds of photos, enabling us to monitor our environment through quantifiable data. Read more about the Infragram project here. Our technique uses a modified digital camera to capture near-infrared and red light in the same image, but in different color channels. 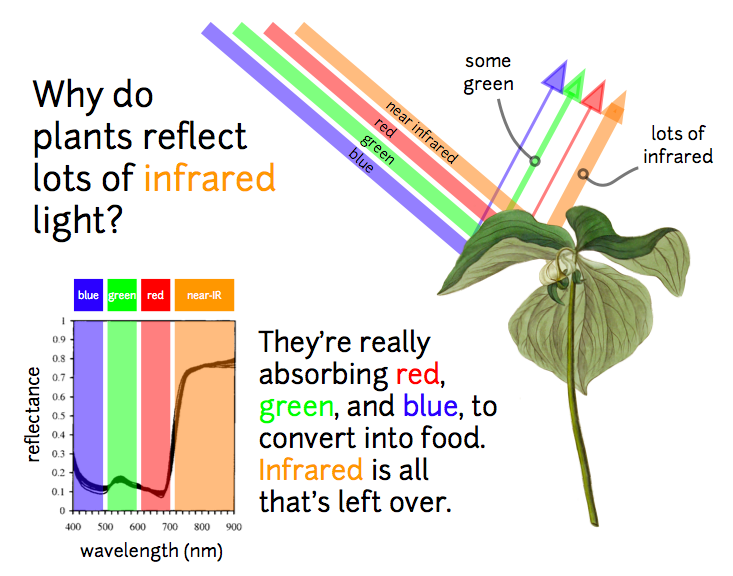 We then post-process the image (see Infragram.org, below) to attempt to infer how much plants are photosynthesizing. This allows us to better understand and quantify how much of the available light plants are using to produce sugar via photosynthesis. Before you begin, to take useful plant analysis photos, you'll have to modify your camera's white balance, so that vegetation looks "bluish" but there is not an overall red tinge to the images. You can achieve this with a custom config file, as described below. Some cameras may require a firmware upgrade to v1.20. If you've gotten your Infragram Point & Shoot from the Public Lab store, both the config file and the v1.20 firmware should be on the SD card provided. However, you'll still have to load up the white balance configuration as described in the Activities section below. These are questions just for the Infragram Point & Shoot, also known as the Mobius Action Cam. For questions about infrared imaging or the Infragram project more broadly, see the Infragram page. 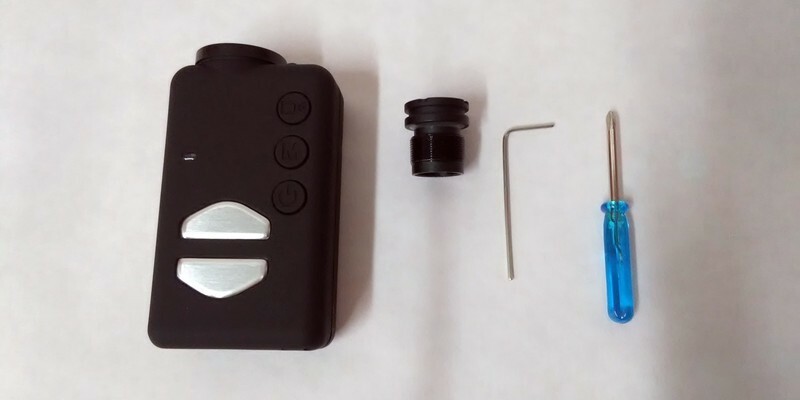 For any information, support, or troubleshooting not covered here, please look to this epic thread about the Mobius Action Cam at RCGroups.com which contains a great deal of information about using and modifying the camera. There is a variety of software available to process your images to calculate NDVI and better understand or compare plant health. See Infrared software for options. To get started quickly, see our guide on Getting started with Infragram.org. One step you need to take to set up this camera is to configure the white balance; otherwise, your images will be flooded with infrared and will look pinkish -- and the NDVI post-processing steps (see above) won't work. Images should look roughly like the "GOOD" example below -- vegetation should appear generally pastel blue. An incorrectly white-balanced image such as the "BAD" example below may appear with an overall reddish tint. This means the camera probably has not accepted your config file, possibly due to misformatting or incorrect uploading.